Feb. 10, 2011 – Mangrove Snapper continues to be as good as it gets here in Naples right now. 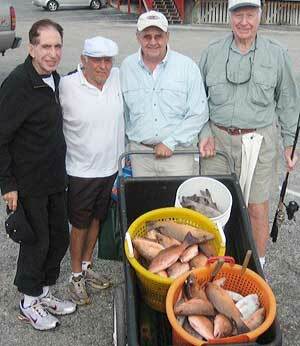 Florida charter fishing is so diverse and Naples is no different. When the winter storms come though our area it causes the water to become murky thus making it easier to trick the hawk eyed mangrove snapper. They are very opportunistic feeders as long as they can’t see your line or hook. The muddy water does the trick as Ted Ballesteri, Emil Ewald and Sam Sharpa can attest by their great snapper catches recently. Come join the fun and see for yourself why so many think winter is the best season to enjoy a deep sea fishing charter in Naples, Marco Island and southwest Florida.